Dry beans, Phaseolus vulgaris-L., originating in the medium elevation mountain ranges of Meso-America and South America, were distributed worldwide by early colonizers. * Leader Bean Program. CIAT, A.A. 6713; Cali, Colombia. tons in the New World, 1 millionn tons in Central Africa and about 0.3 million tons in West Asia, and North Africa. Total production has increased over the last years, but this increase was mostly due to area increases. Beans have been increasingly forced to more marginal agricultural land, to make room for more profitable crops. Most beans are produced by small farmers, many of whom are women, and who are often unable or unwilling to use inputs to increase production. relatively high. In Chile, yields average around it/ha, but in some years they have gone as high as 1300 kg/ha (FAO Production Yearbooks). CITsdocumentation centre discuss yield breeding! breeding early maturing varieties. Early maturit y would shorten the crop's exposure to diseases and insect pests. Admittedly, there were other reasons for developing early maturing varieties, including: to fit beans into a crop rotation cycle, or climate cycle; to catch the early market high prices; or to provide food as early as possible after the dry season. From its formation in 1973 CIAT's Bean Program has placed most emphasis on breeding for tolerance to stress, principally disease resistance. Surveys justified this emphasis. Two studies support this conclusion: a survey in Colombia in 1974-75 identified diseases and pests as the main production constraints both of small and large farmers (Ruiz de Londofio et al, 1978). A second study of a large on-farm project to improve maize and bean yields in Honduras (PROMYF) concluded that the use of fertilizer or other inputs was too risky until a more disease-resistant bean variety became available. stimulate farmers to further increase yields through increased inputs. The Bean/Cowpea CRSP was formed to support research on these two basic foodcrops in the developing world. Of the 18 projects which form the global plan of this CRSP, 12 involve dry beans. Five of the bean projects (42%) are specifically devoted to the development of disease resistance. In the 1984 CRSP Annual Report, 151 articles, reports or presentations are listed of which 30% discuss bean diseases and pests, and only 2% yield potential. Clearly the CRSP, like CIAT, is strongly biased towards pest and disease control through genetic resistance. character deployment) is mainly applied research. programs for national research program personnel help the latter develop and promote new technology to farmers. mainly concentrated in universities where the principle orientation is towards basic research (character development). Progress in basic research allows more rapid progress in the area of applied research, such as is conducted mainly by the national programs and CIAT. CIAT and the CRSP are largely complimentary. The Memorandum of understanding signed by both institutions spell this out clearly. Nevertheless, if either program, CIAT or the CRSP, would deviate from the sphere of its comparative advantage (CIAT concentrating on basic research or the CRSP being over-involved in varietal development and promotion) duplication and waste of resources would result. 'comparative advantage'. US universities geared toward basic research would be financed to resolve bottlenecks IARC's encounter in their applied research programs. Applying the comparative advantage principle, this new AID initiative would well fit within the CRSP crop mandate. The establishment of research ties between US universities and CIAT is difficult due to restrictions on the use of US federal funds to travel to Colombia. Such has not been the case with European agricultural research centres which have increased their Bean Program support through several collaborative basic research projects. In summary, at CIAT we believe that the CRSP and its sponsors should recognize that the goal of improved nutrition requires both basic and applied research. Efforts to make the CRSP projects impact directly on national program production are understandable and humane but, nevertheless, they may prove duplicative and should not be encouraged. Similarly, CIAT should not enter the area of basic research, unless no solutions are available from outside. Progress in research and training over the last decades has been impressive. This is specially so when we take into consideration the relatively small body of researchers investigating beans or cowpeas, as compared to crops such as maize, wheat or soybeans. scientists trained in disease control to 50.4%. training will have a continuing positive effect on future research. developed, and additional resistant parents have been identified. despite limited efforts, has made considerable progress. Resistance to seed-infesting bruchids has been found in wild, uncultivated forms and is being incorporated in commercial cultivars. Bean pod weevil and Mexican Bean Beetle resistance has been identified and used in crosses. Drought tolerance identified so far in beans seems to be mainly related to the ability of bean genotypes to root deeply. The ability to fix atmospheric nitrogen was transferred from tropical germplasm into temporate material. 5. Many national programs 4ave released disease resistant germplasm. Guatemala has greatly increased production and productivity with BGMV tolerant varieties; self-slufficiency in beans has been achieved and prices are down. In 1984, Argentina's .net production increased US$2.1 million by planting new BCMV anthracnose and BCLMV resistant varieties. soon for FAO statistics to reflect those achievements. research progress has been made over the past years. only a very modest dry bean yield increase was achieved. (FAO, Production Yearbooks; Fig. 1). While great- progress has been made in bean research, it is generally not ref lcted in increased yields in the USA or in the tropics. The reasons for this are diverse. Disease resistance may have been overcome by new pathotypes (e.g., for rust) or by the introduction of new strains (e.g., BCMV blackrot into the USA). Earliness is associated with reduced yield potential, and beans, especially in the tropics, have been moved to more marginal land. Past research may have stabilized yields, but one firm conclusion can be drawn: this research did not increase bean yields significantly. change in research strategy was called for by placing greater emphasis on yield potential, as spelled out in our Medium-Term Plan (CIAT, 1985). significant research progress in those Iegumes will affect the competitive advantage of beans. In chickpeas, far example, new,-upright, late maturing, high yielding, Ascochyta leaf blight-res~istant varieties will form a very attractive alternative in many areas where both crops are grown (see ICARDA Annual Reports). Other examples could be cited, where the lack of research progress relative to other crops, has resulted in loosing ground. irrigated areas where diseases and other stresses play an insignificant role. Next in areas where farmers have adopted disease resistant varieties. Yield potential is related to disease resistance breeding. bean yielding ability are simply not available at this time. It is, therefore, my firm belief that the principal factor which will determine beans place among world crops in the future will be based on whether or not their yield potential under stress conditions can be raised. of CIAT's germplasm is photoperiod sensitive and not adapted to the US. variability to better understand the magnitude of the environmental component and the inheritance of quality factors. Reduced emphasis may be given, at least initially, to the biochemical processes involved. basic information on such diseases. The emphasis in bean research in the past has stressed trying to reduce losses caused by diseases and pests. This strategy has, in general, not lead to yield increases. Failure may have been partly due to the narrow genetic base of most research programs. A change in research emphasis is, therefore, proposed. resistance breeding programs and focus on major, unresolved problems, such as BGMV, web blight and, possibly, BYMV. New research emphasis should be funded by shifting resources: In the case of the CRSP, by concentrating more on basic research; and in the case of CIAT, 'by decentralizing research and supporting the genetic improvement through well-trained national programs. locations where the trial was planted. Bean/Cowpea Collaborative Research Support Program (CRSP). 1984. Collaborative Research in the International Agricultural Research and Development Network; a Case Study. 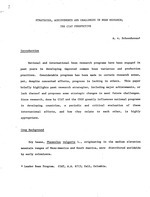 Program Report, May 1984. 157 pp. Burton, G. W. 1981. Meeting human needs through plant breeding: past progress and prospects for the future. In: K. J. Frey (ed.) Plant Breeding II, Plant Breeding Symposium, 2nd, Iowa State University, 1979: 433-466. Centro Internacional de Agricultura Tropical (CIAT). 1985. Annual Report 1984. Bean Program, 311 pp. Centro Internacional de Agricultura Tropical in the 1980s. A long range plan for the Centro Internacional de Agricultura Tropical. 1981. CIAT Series 12E-5, 177 pp. 1980's revisited. A medium-term plan for 1986-1980. 215 pp. National Academy of Sciences. 1972. Genetic Vulnerability of Major Crops. 307 pp. Ruiz de Londofio, N., P. Pinstrup-Andersen, J. Sanders and M. Infante. 1978. Factores que limitan la productividad de frijol en Colombia. CIAT, Series 06SB-2, 44 pp. technology to soybean productivity retrospect and prospect. In: W. R. Fehr (Ed.) Genetic contributions to yield gains of five major crop plants. Proceedings Symposium, December 1981, Atlanta, Georgia, CSSA Spec. Public. 7, 101 pp. w 1300 1200 48/52 52/56 63 64 65 66 67 68 69 70 71 72 73 74 75 76 77 78 79 80 81 82 83 YEAR Fig. 1 Dry bean yield trends in the United States.